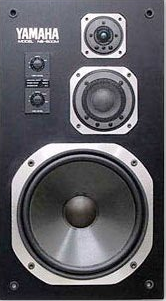 The Yamaha NS-500 speaker series consists of two different speaker models. The NS-500, a two-way speaker with a Be tweeter and the NS-500M, a three-way speaker with a titanium midrange speaker and the same Be tweeter. “Be” refers to the beryllium deposited in the manufacturing of the tweeters, which ought to make them stronger, lighter and more responsive. NS-500M speakers have a weight of around 51 lbs. and measure 14 ¾” x 26 5/8” x 12 ¾” . Even though both speaker models are of high quality, the NS-500M is rated higher in reviews, not at last because it is has a midrange speaker. Both models include a 12” woofer and Yamaha´s 2” dome be tweeter, the NS-500M includes the mentioned 4” semidome midrange speaker. Be aware that the midrange speaker is not the beryllium midrange, used in the bigger Yamaha NS-1000. Both, the NS-500 and 500M include two level controls under the speaker grills. One control allows to adjust high frequency sounds, the other adjusts the midrange. When altering these controls, set the midrange control to the desired level before altering the high levelcontrol. If you are looking for specific information about the NS-500M, you will find plenty of manuals on the internet or just click the link at the end of the article, which will open the correct link at audiokarma´s manual database. In case you are looking for a pair of these speakers you should be aware that many of the 500´s seem to be in only mediocre shape. Scratched cabinet veneer or necessary refoaming seems to be a typical issue. The lower price for the NS-500 and the conclusively less audiophile target group might be a reason for this. A decent price for the NS-500 in moderate condition is usually around $200-250. The NS-500M speaker is rarer and has a higher value, as the significant quality difference is a big plus for many vintage speaker fans. For a moderate NS-500M buyers should expect to pay $300 to $400, rarely less. I wasn't sure if there was any information on the NS-500M speakers. I enjoyed reading this review because I purchased these speakers in the 80's and have them still. They are very good speakers and I will never sell them especially since you said the M model is rare to find. I thought they were fantastic from the day I bought them!